Please see if your question is answered in the FAQs below before getting in touch via the contact form below. Please note that Doula UK is run by volunteers, so it may take up to a week to respond to your email. Please log in and visit this page to see who to contact before getting in touch. If you require an urgent response please call 0871 433 3103 to speak to a member of the team during office hours, Monday to Friday. If you leave a message we aim to call you back within two working days. I am thinking of becoming a doula – what do I need to do? You will find all of the information you need about becoming a doula, and joining Doula UK here. What are the possible benefits of hiring a doula? Yes, you can read about the available research here. If you are looking for a doula please use Find a Doula. You will find information around what doulas do, and what they charge on that page. 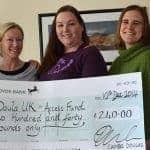 Doula UK is the membership association of 700 birth and postnatal doulas. Every doula on our directory is self employed but all have completed an Approved Preparation Course, and are being Mentored or have completed that process. We encourage you to explore all of the profiles, because the right doula for you may be somebody who is quite new to doulaing! You can read about the benefits of hiring a Doula UK doula here. How do I choose my doula? We offer guidance on this process, including questions to ask and things to consider here. I can’t afford to hire a doula – is there any other help available? You’ll find helpful information and links here.